Suitable for all types of business, Reputation Aegis helps Small & Medium Businesses, Franchises, Large Businesses with multiple locations, to get a competitive advantage. We are technology partners with companies (developers, SaaS platforms...) wanting to offer better Customer Intelligence to their customers. Helping your Company Close More Business by Measuring, Improving Customer Experience and Monitoring, Protecting Brand Image is our goal. Simply ask Customers for Feedback at the right time in their Customer Journey. Reputation Aegis does the rest and collects Valuable Customer Intelligence Info. At the end of the Customer Journey, Feedback can be transformed into Reviews and promoted not only on your website, but all over the web on social networks. The platform also closely Monitors your Online Reputation and Overall Customer Experience. All the Reputation Aegis tools have been carefully designed to assist you in Building Brand Authority and Social Proof. It will help your Brand rank higher online by Marketing your 5-star Customer Experience everywhere. Reputation Aegis improves your Brand Image Online and Offline while creating a Powerful Shield to protect your Business Reputation. Learn How the Platform will give your Brand Competitive Advantages. Enter your customers' Emails and/or Mobile numbers to the Platform (Full Automation can be easily achieved from any existing software or SaaS platform by your software developer). Let Reputation Aegis work! We reach out to your customers with a personalised Feedback Request via Email and/or SMS * and we do the follow-up. Optimised for Mobiles & Tablets, the Feedback Form can be fully customised with Survey Questions, Photos and even Video Testimonials (that can be auto-posted to a YouTube Channel!). Intelligent routing & Multi-lingual support is included. Throughout the Customer Journey, Gain Immediate Customer Intelligence and Knowledge of your Strengths and Weakenesses on Products, Services and even Employees. We Monitor Brand Image & Collect New Reviews across all major Review Sites Worldwide. When Positive Reviews are discovered on any of the Monitored Review Sites, they are published on your dedicated Review Page (see below). For a full list of monitored review sites: click here. If we are missing a specific Industry Review Site: Request it! Your 5-star Customer Experience gets immediate exposure. Your Review page integrates perfectly to your Website and as an App on a Facebook Page - It is also Optimised for Search Engines & Multi-lingual! We auto-post Positive Reviews, at your desired pace, to your Social Pages: Facebook, Twitter, Google +, Linked In and Pinterest. When a Review is collected, the Reviewer can easily share it on his preferred Review Sites. Your Review Page does not only get indexed in Google Search: it displays the stars in Google search results. Reputation Aegis is also approved for Review Rich Snippets: your Overall rating will appear on your Company graph (Knowledge Card). Export Positive Reviews with 1-click and use them in your Sales & Marketing Materials. Market your 5-star Customer Experience! Knowledge is Power! Reputation Aegis knows who your satisfied customers are, and so do you! Segment Customers to Send Special Offers, Run Deals, and more to Make Repeat Sales. Our collection, moderation and publishing processes comply with the recommendations by the Competition & Markets Authorities throughout the World, including the Federal Trade Commission (USA): FTC Website, and the 58 members of the International Consumer Protection and Enforcement Network: ICPEN Website. ... and we are fully compliant with Google recommendations and also follow the recommendations of the ISO 20488 standard on Online consumer reviews. 1. Collection: Reputation Aegis acts as a 3rd-party and collects customer feedback and reviews for participating brands or companies. Any customer of the brand or company can give feedback and post a review. Reviews are collected only if the user is authenticated; anonymous reviews do not get published. 2. Moderation: Participating brands or companies cannot modify or delete reviews. Before a review is published, brands or companies can respond to a customer’s complaint. This helps resolve the issue with the customer before the review gets published. 3. Publishing: All reviews are treated equally, whether positive or negative, and are all published within the same time frame. By default, reviews are listed, from newest to oldest post, and are grouped under 3 different categories: 1. Platform collected reviews from verified customers - 2. Platform collected reviews we could not verify - 3. A selection of reviews found across the web on various 3rd-party review sites. The overall review rating is calculated without any weighting and represents the sum of all ratings divided by the number of reviews. For the Overall rating & Ratings distribution calculation, we only count reviews collected through the platform from genuine customers. Reviews posted more than 24 months ago are not considered when calculating the overall review rating. Reputation Aegis is HIPAA Compliant. 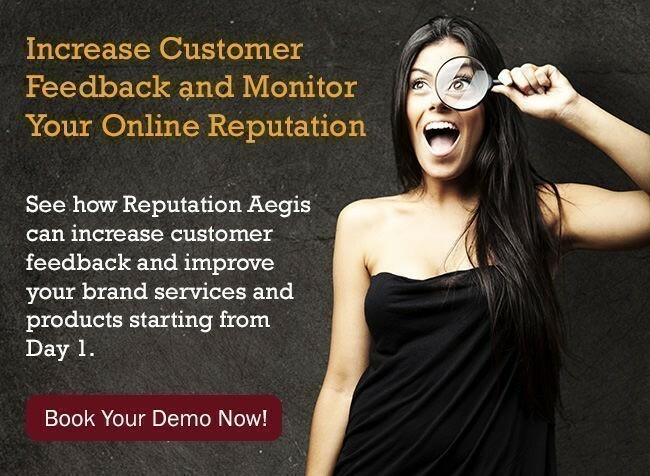 All over the World, Brands and Companies of all sizes, in many different industries, rely on Reputation Aegis to improve Customer Experience and Drive Revenue. Click the links below each Brand / Company to see Reputation Aegis in action! Start Measuring, Improving and Monitoring your Brand Image Today! Please type your First & Last Names. Number of Locations *12-56-1011-2526-5051-100More than 100 Tell us how many Locations your Company has. CEO CMO CCO Owner - Shareholder Other Please specify your Position in the Company.